Kagrenzel is a small Dwarven ruin located high in the Velothi mountains, east of Ansilvund, northeast of Shor's Watchtower. You can get to Kagrenzel by taking an unmarked path that starts due east behind the tower of Ansilvund. 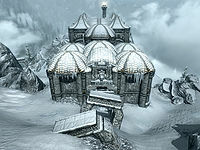 Be careful as you progress, as you may encounter a leveled conjurer at the tower and some frost trolls along the path. There is an unmarked hunter's camp a short distance south of the path on a ridge, where the path turns to the northeast and just before the start of several flights of stairs leading up to the ruin. It is inhabited by two hunters and contains a campfire with a wooden bench beside it. There are two small tents containing unowned bed rolls, with a snowberry bush between the tents and a few barrels of food around the fire, one of which has a copy of the Archery skill book Father Of The Niben on top. The skill book is marked as unowned and is free to take. There is an iron ore vein by the top of the first flight of stairs. There are three more flights to climb and two square arches to pass under. At the top you can see a large Dwemer building. The entrance is on the east side of the building with three damaged square arches in front. A short distance east is a moonstone ore vein and a short distance northeast is a gold ore vein. 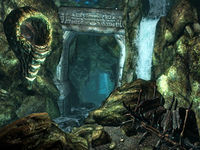 Through typical large metal doors found on Dwemer ruins, it is an empty room with stairs opposite leading to another pair of metal doors. These open into a cavernous room with three pillars in a row opposite. The room is fairly dark with rubble all around. In the center of the room is a stone pedestal with the bodies of two dead bandits lying on the ground beside it. Every few seconds an orb appears accompanied by musical chimes. As you approach, the orb and chimes remain constant. There is a metal circle on the floor surrounding the orb and bodies. It is best to save at this point. 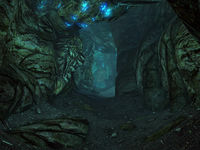 Touching the strange orb causes a Dwemer cage to ensnare you as the orb rotates around the outside several times, shrieking until the floor gives way. As you plummet hundreds of feet below the surface of Skyrim, you can guide your fall. If done properly, you will survive by landing in a deep pool of water littered with the bones of a mammoth. One way to minimize the chance of hitting anything on the way down (and dying) is to clear the platform of all bodies and pots before you touch the orb. Then stand in the exact center of the platform and wait for the floor to open. Swimming down from where you landed in the pool, you will discover an expert-locked Dwemer chest. There is a tunnel near the edge of the pool to the south with Falmer hives on either side and an unlocked Falmer chest sitting just to the right on a large rock. As you head up the tunnel it turns east after a few paces and starts to climb very steeply. There are Falmer hives on the side wall; however, most of these are empty. The use of Detect Life spell or Aura Whisper dragon shout is recommended. The ground may shake and the occasional rock may roll down, causing minor injuries if it hits. At the top, where the passage turns north there is a moonstone ore vein. You will eventually re-enter the main chamber on a rock L-shaped bridge with a large fire pot burning in the corner. On the left-hand side of the fire pot is a small adept locked Dwemer chest, with a random potion of invisibility beside it. A patrol of three Falmer will enter onto the bridge from the opposite end, then cross to the side you entered through and then return back the way they came. There is also a fourth hidden in a Falmer hive on the wall at the far side. After crossing the bridge and continuing following the passage, passing several more Falmer hives until you reach a section with two waterfalls, one in front and one on the left, an archway, and another Falmer chest. Climbing up to the waterfall on the left hand side will reveal a centurion dynamo core within the stream. A flawless diamond will be visible from this position atop the archway (see notes for suggested methods to retrieve it). Following the stream passing under the arch to exit to Stony Creek Cave. Facing the entrance outside you are facing west, however as soon as you enter with your back against the door, you are now facing south. For quests related to Kagrenzel, your map marker may point you to Stony Creek Cave. This applies to your Clairvoyance spell as well. The large cavern beneath the ruin may be accessed via Stony Creek Cave, however, the room with the glowing orb is not normally accessible if you enter from this direction (see bugs). If you have a follower, they may enter Kagrenzel with you from this direction, and then disappear and not return. Frequently this is because the game placed them at the top of the main chamber instead of beside you, and they fell and died outside your view. The diamond on top of the archway can be retrieved in multiple ways, such as using Telekinesis, Unrelenting Force or simply an arrow. If you go to your map while at the beginning of the cavern, you can see massive rib cages. It is unknown what these are from. It is possible to reach the glowing orb's room from the lake room by swimming through the wall north of the rocks that jut into the lake, on the east side. This page was last modified on 26 June 2018, at 00:09.